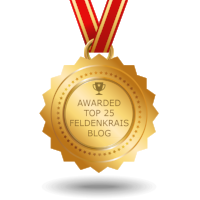 Feldenkrais Method uses developmental movement. Do you have any guess why?? There are several reasons but I will explain one here. Children rely on their own kinesthetic senses (subjective) to make a decision. Adults, on the other hand often make a decision based on objective information (norms of the society, opinions of others). This happens as we learn to act in accordance with the rules set by our society. As a result, we move away from our own senses to make a decision. When our senses do not match our decision that was made based on objective information, stress (physical and emotional) will be created. What we are doing is basically trying to make our senses fit into the norms of the society and others. We can re-learn how to connect to our own senses, ourselves like children so we can make a decision based on our senses, which will free your tension (muscular and emotional). We use developmental movement to create similar learning conditions and processes to the first few years of our life when the only thing we could rely on was kinesthetic senses, which has nothing to do with the norms of the society or opinions of others. During Feldenkrais class, a teacher does not show students how they need to move. Instead, students will be verbally directed to their own kinesthetic senses. As you practice more, you will become more sensitive and you will be able to recognize when you go back to your old habitual pattern of relying on objective information to make a decision, which may not match your senses. At this moment, you have a new choice, that is, to tap into your own kinesthetic senses to make a decision. Then you have more freedom than you did before. Get help to move freely, comfortably, and gracefully.